West Palm Beach, Fla. (January 24, 2018) – GN Media – an affiliate of Greg Norman Company (GN) – announced today that the PGA TOUR will join an expanding list of companies partnering with Shark Experience, where the TOUR will distribute its live programming to enhance the on-course experience. The PGA TOUR joins a robust list of industry leaders including Verizon and Club Car to deliver unprecedented connectivity, content and customization to the course through a connected golf car experience. As part of the new strategic partnership, the PGA TOUR will contribute live and on-demand coverage from more than 30 TOUR events via PGA TOUR LIVE, as well as all weekend telecasts produced by CBS and NBC Sports. Golfers in Shark Experience cars will be able to watch PGA TOUR events as soon as Shark Experience launches in the spring. 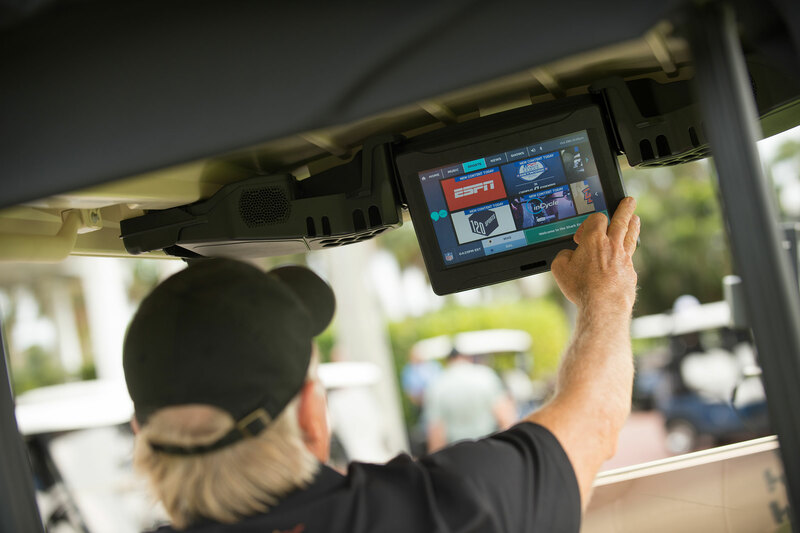 Leveraging Verizon’s leading 4G LTE network technology, the connected golf cars include a high-definition touchscreen display and built-in speakers with Bluetooth connectivity – all exclusive to Club Car golf cars. Golfers will enjoy live PGA TOUR coverage and curated content from Verizon, including streaming music via Slacker Radio, live sports and highlights, news and entertainment, Greg Norman golf tips, dynamic yardage information, and more. Shark Experience is currently in pilot and will preview at the 2018 PGA Show in Orlando at the Club Car booth #2928. The new technology will roll out at select golf courses across the U.S. throughout 2018. In addition to the curated content available at launch, features including hole-in-one technology, food and beverage ordering, Shot Tracer and more will become available as the platform continues to evolve.